This is a complete ultra-lightweight alcohol cook kit for water-boil only. 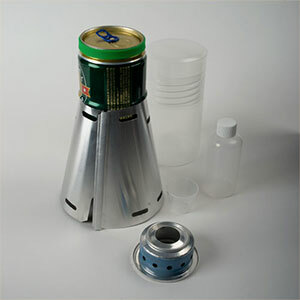 It uses a 750ml Fosters beer can as the pot and comes with the Caldera Cone windscreen/pot stand, lid, caddy, and more. The entire kit without fuel bottle weighs less than 7 ounces. Pot arrives empty – you don't get the beer! 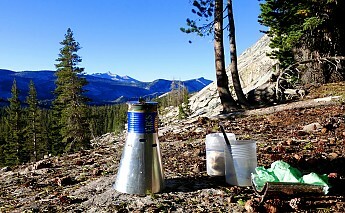 This is a review of the Caldera Keg-F cook kit by Trail Designs. I am not associated with TD in any way nor received any special consideration. This is a complete alcohol cook kit for water-boil only. It is called the Keg-F because it uses a large (750ml) Fosters beer can as the pot. The heart of this system is the Caldera Cone. Trail Designs sells a variety of kits, each one with the cone sized and shaped for a specific pot. You can use your own pot or they have a selection of kits that include pots, just be sure that the kit you get has the cone that matches your pot. The Cone acts as both windscreen and pot stand. 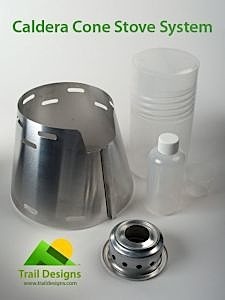 The cone sets up easily with a titanium-reinforced dovetail closure, and each is designed so that the top circle of the cone is a perfect fit with the pot it was made for, so that the pot slides in but the lip of the pot doesn't fit through and rests on the top of the cone, and that is how the pot is suspended (in the case of the Keg-F, the pot rests on top of the cone on a ridge that Trail Designs presses into the side wall of the Fosters can). 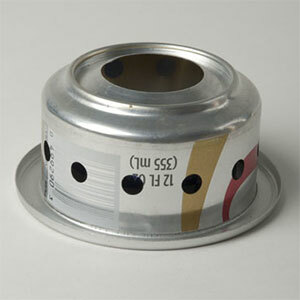 The cone is further designed to hold the bottom of the pot at the most efficient height above the 12-10 stove. And, because it is cone shaped, it is widest at the bottom, making the setup extremely stable – you would really have to give it a hard blow to knock it over. The end effect is a very fuel-efficient setup. Even though the Fosters pot has a narrow bottom, the cone design has most of the pot hanging inside the cone where it is enveloped in the trapped heat. And, most if not all of the water in the pot will be in the portion hanging inside the cone, so the kit gives the water maximum exposure to the heat — I can get a boil in about 7 minutes on a half-ounce of fuel. The cone by itself weighs 1.3 ounces (all weights I list in this review are on my scale not manufacturer claims). As noted, the pot is a 0.75L repurposed Fosters can. The top of the can has been "safe-cut" without the tab being pulled, so there are no sharp edges and the top fits back on the pot as a lid. Trail Designs presses bead-rolled ridges or "ribs" into the side walls of the pot. These add a surprising amount of strength to the can (and give it a better grip as well). One of the ridges is larger than the others, that is the one that sits flush on the top of the cone to hold up the pot. And, that ridge is at the 2-cup water mark (very common amount needed for dehydrated meals) so very nice functional design. You do need to keep in mind that, even with the added rigidity of the ribs, it still is just an aluminum can so still is crushable. If it gets a little ding you probably would be able to use your fingers and pop it back out from the inside, but crushed it could be a lost cause. Don't get me wrong, it's still plenty sturdy for handling, you just don't want to jam a bear canister against it in a tightly-stuffed pack or fall on top of it. In fact, this is what the caddy is for, it does a good job of protecting the pot in your pack as well as keeping the whole kit together. Since the pot is 750ml it is a great size for solo backpackers, some people might be able to stretch it to use for two hikers. The pot by itself weighs 0.85 ounces, and the lid is another 0.24 ounces. 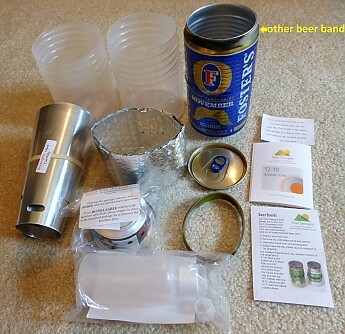 Since the pot is a beer can it doesn't have a handle, so the kit comes with two silicone bands that can be placed on the pot to give finger holds and to place at the top edge so if you wanted to drink out of it you don't burn your lips. And, the kit comes with a reflectix cozy designed to fit around the pot, to help in picking it up when it's hot or hold when drinking from it. One beer band is slightly larger than the other, they weigh approx 0.15 and 0.2 ounces each and the cozy approx 0.2 ounces. This really is a water-boil only setup. You probably could do some simple cooking in it like boiling pasta, but then it would be difficult to clean in the field because the pot is tall and narrow. So it's great for dehydrated meal eaters. 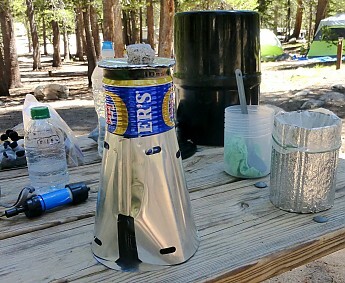 And, this is an alcohol or esbit-only setup — the pot is thin aluminum so shouldn't be used with a canister stove or wood fire. The good news is that alcohol fuel is very efficient, readily available and fairly cheap. 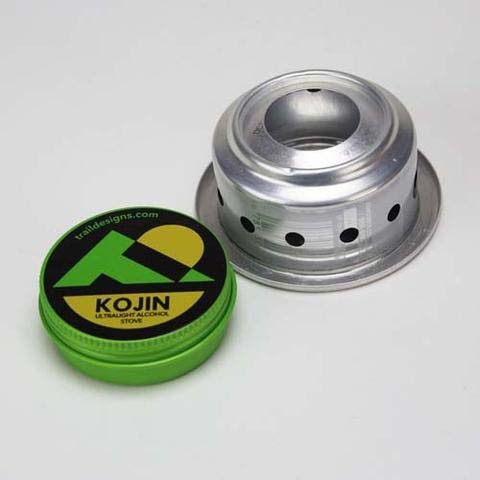 (TD has other Caldera Cone models where the cone is titanium and made to work with a ti pot, and those can take the higher heat of a canister stove or wood fire). 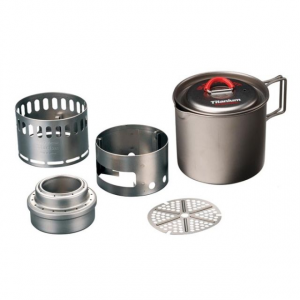 The 12-10 stove is made from a repurposed aluminum beverage can and weight 0.52 ounces. It has a built in primer pan. 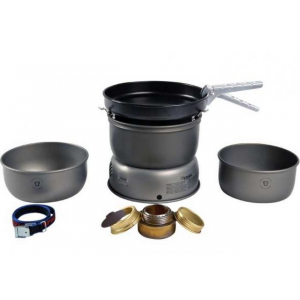 Please note that this stove is not designed for the pot to sit directly on top of it, you need a pot stand with this stove (if using the Caldera Cone then that functions as your pot stand). It lights easily and can boil 2 cups on about a half-ounce of fuel. The caddy is a cylinder made from lightweight food-grade plastic. It comes in two pieces that screw together to fit around the pot, holding everything inside. The cylinders are about the circumference of a hard-side Nalgene on the outside, but wider than a Nalgene on the inside because the walls are much thinner, in fact the caddy is just wide enough inside for the Fosters pot to slide in. The two parts of the caddy can be used as serving containers as well – one is a little taller that you can use as a bowl and the smaller one as a mug or second bowl. The caddy (both parts) weighs 3.1 ounces. The minimum setup of pot, lid, cone and stove weighs a scant 2.96 ounces on my scale. Adding the caddy, both beer bands and cozy brings the total kit (without fuel bottle) to 6.77 ounces. It's cheaper – the entire Keg-F kit costs less than some ti pots alone. Some ti pots of the same capacity weigh upwards of 6 ounces with lid, so the Keg-F can be a lighter system. For me it is a better shape for packing. The Keg-F kit in the caddy is a relatively tall and narrow cylinder, similar shape as a hard-side Nalgene or many shelters in their stuff sacks. By contrast, many ti pots are short with wide bottoms, creating more of a "thick disk" shape that I find harder to work into my backpack. By the same token, I don't find the shallow-wide shape of most ti pots to be good to use as a bowl for freezer-bag cooking (leaving the bag in the bowl and folding the top of the bag over the top of the bowl, as shown in my pics). And along those same lines, the tall-thin shape of the Keg-F caddy is easier to hold in one hand than most ti pots. The Keg-F caddy gives you both a bowl and a cup (or 2nd bowl), a ti pot can serve as only one or the other at a time (you can add a separate mug to a ti cook kit but that increases the total cost and total weight plus the mug probably won't fit inside the pot along with everything else so increases you packing volume). You always have the option of leaving the caddy at home to save weight (not an option with a ti pot setup). You just would have to be careful with how your carry your crushable Fosters pot (I've heard of some who roll it up inside a foam sleep pad). You have more options to cook "real" food, not just boil water. You have more fuel options – canister and wood-burner in addition to alcohol and esbit. Ti pots come in a variety of volume capacities, the Keg-F pot is only available as 750ml. Usually has one or more handles. Stand-alone, a ti pot is much stronger and crush resistant than an aluminum can pot. All in all the Keg-F is a great lightweight cook kit for freezer bag cooking. Trail Designs is great to work with, they are responsive and they ship quickly. I will say that I have modded my kit a bit, I won't go into much detail about that here because this is a review of the product sold by Trail Designs. My mods are that I have added DIY cozies for the two parts of the caddy and removed the cozy TD provides (because it fits around the pot but not around the caddy), I don't take the Fosters can top for a lid because part of my DIY cozy can serve that purpose, I use only one beer band, I have swapped out the 12-10 stove for a Zelph's Starlyte stove, I added a floor/basesheet made from an aluminum turkey/lasagna pan, and I carry a LightLoad towel with the kit. Thanks! I like the stuff from Trail Designs, lightweight & effective! Great review, JR! Thanks for sharing it. I've been hearing about the legendary Foster's Beer cans for years. Wish we could still get them in the states. Thanks JR! I've been considering a Caldera setup for my Ti pot set. his really helps. Stove is lightweight and has a very efficient design. Stove is lightweight and has a very efficient design. Boils 2 cups of water in 7 minutes or so. 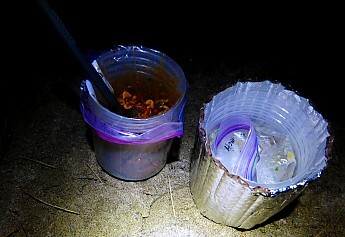 As mentioned, best for boiling water to add to rehydrate meals for one thru-hiker or two day-hikers. Highly recommend! After using the MSR WhisperLite for years on previous backpacking outings, I was glad to find/switch to the Caldera Keg-F Stove System. It is much lighter and easier to set up, and is less bulky to pack. I don't need to bring the nested pots or the gripper as well. 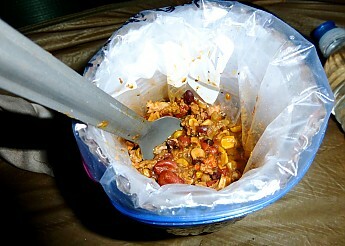 Don't get me wrong, the WhisperLite is a powerful stove and is better for actually cooking a more "complicated" meal as you might do at home, but with the Keg-F I can simply boil water in 7 minutes or so and add to a dehydrated meal, wait 10 minutes, and then eat. 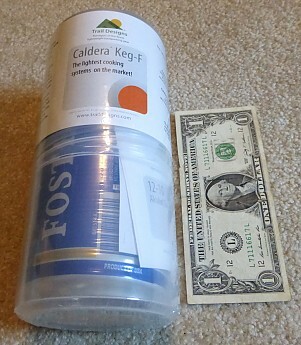 As I said, the Keg-F is easy to set up...just take contents out of the plastic caddy, slide the edges of the cone together, place the Fosters can in the top of the cone (be careful sliding it in), and add the amount of water you need. There is a handy marked ring on the inside of the can that indicates when you've reached 2 cups. Then you can add the alcohol to the stove (put a little in the well around the outside of the stove to help in lighting), light the stove, and position the cone and can over the stove. Now you can start getting your meal ready, and in 7 minutes or so you add the boiling water. The cone that you placed over the stove helps in blocking out wind, provides a stable base, and helps keep the heat focused on the bottom of the can. This is NOT a stove that allows simmering, fyi, so keep that in mind. I find that at the end of a day of hiking I just want a hot, nutritious meal. I don't need to add ingredients to a pot and bring to a boil, etc. So it comes down to a matter of personal style. The plastic caddy unscrews into two sections, each of which can be used as a cup or bowl, which is useful if you want to make tea or coffee, or have oatmeal for breakfast, etc. The cone and pot cool down very quickly after the hot water is used, by the way. This a cool system, really efficient, and it packs away into a container slightly larger than the Fosters can itself. It is a durable system, but care should be taken not to bend or crush the beer can. For me, this incredibly light cooking system is worth the tradeoff of not having a "real" stove in the outdoors. Welcome to Trailspace, Jim, and thanks for sharing your first review with us. I'm curious to see some pictures of your Caldera setup, if you're willing to add some to your review. 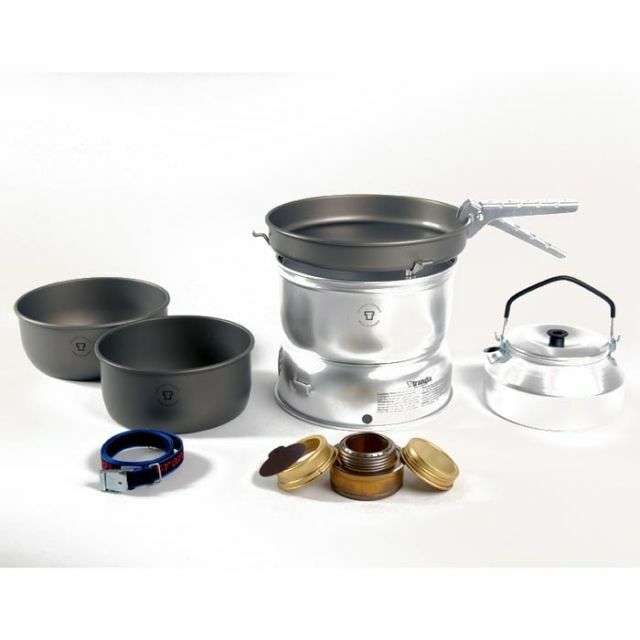 The Trail Designs Caldera Keg-F Stove System is not available from the stores we monitor.